Are you planning a trip to Florida and looking for September 2020 Orlando flights? It’s not too early to book – we have advance rates on Virgin, British Airways, Norwegian and United. Call us on 01934 319 851 or complete an enquiry form for an email quote. If possible, avoid a weekend departure. Tuesday and Wednesday flights are the most economical. Book early. Flights are released 11 months prior to departure. But don’t wait until then – book now for an excellent advance fare. How much are you expecting to pay for September 2020 Orlando flights? Don’t be surprised by high street prices in excess of £700. Book in advance with us and you could achieve prices of £425 per adult and £350 per child. Looking for September 2020 Florida flights on the best airlines? Fly with Virgin, BA, United or Norwegian at a great-value price. When flights are released we monitor fares daily. Once prices drop to a competitive rate we book your seats. It’s a simple method that yields great results. Advance bookers are first in the queue when prices drop. Book with us today for a great price on your September 2020 Orlando flights. Most of our customers fly to Orlando International in the heart of Florida. Miami, Tampa or Fort Myers might be more convenient – and sometimes better value. Heathrow’s indirect flights are the cheapest option for peak-date weekend departures. Otherwise, a direct flight from Gatwick is good value throughout September. Northern customers might prefer to depart from Manchester or Glasgow – both offer direct flights at a decent price. If you want the convenience of departing from your local airport, let us know. A Flybe connection from Belfast, Aberdeen, Inverness, Edinburgh, Isle of Man, Exeter, Newquay or Jersey is available. Schedules are convenient and your hold luggage is checked straight through to Orlando. Don’t wait any longer – advance bookers are first in the queue when fares are released. The sooner you book, the more time we have to achieve a good price. For additional value, combine your flight with vehicle hire. We deal with the major car-hire suppliers and provide Florida fly-drives at a great price. We also book villas, hotels and townhouses for a complete holiday package. Call us on 01934 319 851 for an instant quote from our Florida experts. All of our September 2020 Florida flights and holidays are ATOL and ABTA protected. Book today with a deposit of just £100 per person. Enquire now. Avoid summer's peak prices with a September 2020 Florida holiday. 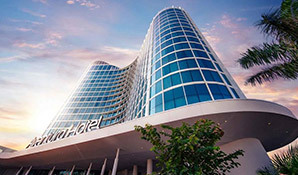 Fly direct to Orlando, pick up your hire car and stay for two weeks at the Aventura, Universal's newest hotel. The sleek, contemporary Aventura is ideal for small families. On-site facilities include a swimming pool with kid's splash zone, a games room with VR & motion tracking, and a state of the art gym. Dining options are plentiful, including a rooftop bistro with fabulous views. The theme parks are on your doorstep. Free shuttle buses are quick and easy - or you can walk via the interconnected pathways. This September 2020 Florida holiday includes flights, car-hire and accommodation. Book now from just £975 per person, ATOL and ABTA protected.